The Internet has been abuzz for the past little while about an article published by The Atlantic called simply “My Family’s Slave.” In it, journalist Alex Tizon attempts to reckon with the fact that, for his whole life, he watched while his parents abused and browbeat a woman named Lola who was their live-in domestic servant. As he explains, in certain parts of The Philippines, where his parents were born, slavery was a part of everyday life, with people being traded and gifted like a commodity. Lola was taken from her family by Tizon’s grandfather and gifted to his mother. When the family emigrated to the U.S., Lola came with and served the family without recompense for nearly six decades. The most troubling parts of the article have to do with the mental gymnastics everyone went through to justify both keeping a slave in the house and treating her as poorly as Tizon’s parents treated Lola. Everyone made excuses and tried to brush aside anyone’s concerns when they arose. Even Lola played the game, insisting to strangers that she was fine and that everything was normal. And that’s not even the most troubling moment of this episode. 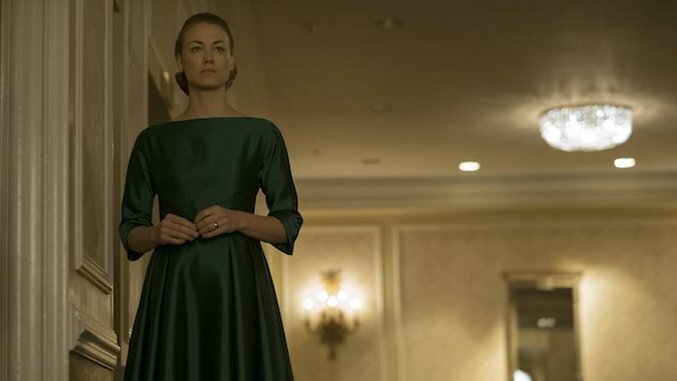 While the big kicker is the reveal that Luke, the husband of Offred/June (Elisabeth Moss), is still alive, what comes before that unveiling is especially chilling. It has just been revealed that the Mexican trade delegation that came to the U.S. wasn’t there to discuss sending vegetables or arms across the border: They were looking to deal for some Handmaids of their own. Once she knows that, June lets it all out about how poorly they’re all treated and begs for help. In return, the shaky ambassador tries to explain that her country is dying because no new children are being born. Their economic self-interest is of far greater importance than how these women in what used to be the U.S. are being treated. It’s a direct shot at the way that so many countries around the world justified the buying, selling and trading of thousands of people from Africa for decades. Without the labor and toil of these people ripped from their homeland, the excuses went, we’d be doomed as a society. The reason that Tizon and his siblings kept quiet about Lola’s treatment was that his parents supposedly ran the risk of being deported back to the Philippines. Or, more likely, that for all his attempts to make up for it all by having Lola live with his own family after his mother died, he had gotten so used to being waited on by this poor woman that—unconsciously or consciously—he didn’t want to give that luxury up. That’s where things get especially complicated, as the episode takes us through the early days of the faith-based coup that ended up turning the U.S. into Gilead. Serena Joy was a woman of great power before everything changed, writing books and leading a religious revolution in support of the beautiful euphemism, “domestic feminism.” But as men of “faith” started to seize more control, they quickly began subjugating their wives. At first, as shown in one flashback, it would seem that the Commander (Joseph Fiennes) was troubled by this turn of events. But in the present day of the series, he seems to love his place at the head of the household. Doubtful that one softly lit love scene with his wife will do anything to change that. For as much as Serena furrows her brow and shakily smokes through these episodes, there’s a sense that she, too, is happy to look the other way at the embarrassment of this world because it has afforded her luxury and wealth. We get used to things being one way.